Product quality and passion for perfection are the values that have fueled the growth of Taylor Guitars for the past forty years. This commitment to excellence is what has spurred co-founder Bob Taylor to do things differently than the rest in today’s mass-production culture. While most large guitar manufacturers don’t have the original founder/guitar builder involved in the business, after 40 years Bob remains as passionate as ever about building guitars. 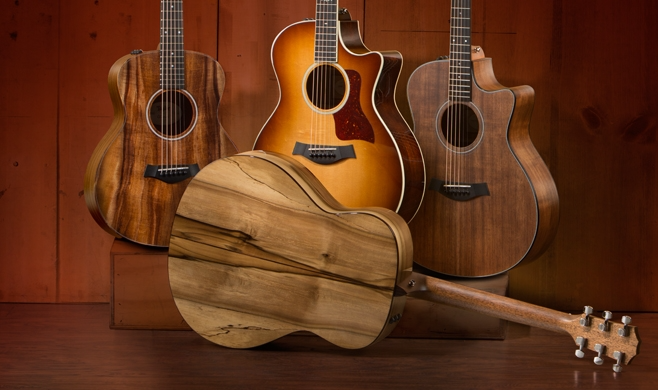 With worldwide forest acreage dwindling and consumers snubbing guitar models made from alternative materials, guitar makers have had to search globally for their wood supplies. Taylor has made a firm commitment to farm its worldwide sources in a sustainable manner, while improving the quality of life for its source communities. Bob Taylor & Team at their mill in Cameroon. Taylor has made its most notable impact in responsible farming and sustainability with two frequently-used guitar woods: mahogany and ebony. The forest-dwelling community of Copén, Honduras is legally permitted to harvest about 21,000 board feet of mahogany per year. Over ten years ago, even though Taylor was able to source mahogany from Belize, the company took the risk of developing this community to become a supplier, in the name of sustainable practices. Bob partnered with non-profit organizations GreenWood Global and MaderaVerde (Greenwood’s local arm in Haiti) as well as the U.S. Forest Service to train Honduran community sawyers in the production of high-quality mahogany guitar parts from well-managed forests. It took four years before Taylor received its first container of wood from Copén, but since that time Copén has come to be considered a shining example of social foresty. In fact, the program has worked so well that two other Honduran communities, Miraveza and Limoncito, have partnered with Taylor to supply wood for guitar necks as well. Taylor’s newest mahogany supplier is Fiji, home of the largest mature mahogany plantation in the world thanks to the English who planted it there roughly 100 years ago. On July 27, 2010, Taylor representatives visited Fiji for the first time to meet with TABS Investments, the company bridging the gap between Taylor and Fijian landowners. By June 28, 2011, the first consignment of Fijian mahogany was ready to be shipped to the US. Consignment amounts from Fiji have increased steadily over the years. The ebony used to create Taylor’s guitars comes from Cameroon, the only country in the world where it is legal to harvest ebony. In 2011, Taylor purchased Crelicam, a local ebony mill. While the goal was to ensure that Taylor had access to legally-harvested ebony, the larger vision of the purchase was to transform Cameroon’s ebony business into responsible social forestry. When Bob first began researching the ebony trade in Cameroon, ninety percent of the ebony trees forested were being rejected due to imperfect coloration. Bob abandoned that unsustainable practice; Taylor now uses any ebony milled regardless of color, and Bob has campaigned to encourage his competitors to broaden their ebony standards as well. Many other changes implemented by Taylor have made the ebony industry in Cameroon safer and more profitable for the workers. Taylor has installed current machinery, has provided education and training, has doubled wages, and has enabled the mill to add value to the wood by further processing it into instrument parts before it is shipped. And Taylor not only makes sure that its own wood is ethically milled; Crelicam also works with Cameroon forestry officials to strengthen and enforce forestry laws. In January, 2014, US Secretary of State John Kerry recognized Taylor’s work in Cameroon with the Award for Corporate Excellence. The Taylor 314ce is the Taylor “workhorse,” and is cherished by those who love the Taylor brand. And what’s more, eco-conscious musicians can celebrate that the guitar is significantly crafted from sustainable sources. Taylor does not use mahogany for the guitar’s back and side wood, but rather sapele, also known as African mahogany. Sapele is a highly-sustainable wood that is tonally similar to mahogany, but provides a little extra zing in the treble. The neck and heel of the guitar are made from tropical mahogany, and the fret board and bridge are made from Camaroon ebony. The face of the 314ce is made out of Sitka spruce, which is used on 85 to 90 percent of Taylor guitars and is the standard wood of the entire music industry for all acoustic soundboards. While Sitka spruce has some sustainability issues, it is not due to music industry consumption; rather, the vast majority of the wood is used to create building supplies in Asia. Regardless, all of the big guitar makers, including Taylor, are working together to ensure its survival. The 314ce features the Grand Auditorium body shape, Standard II X-bracing and Taylor’s patented relief rout. These features combine to deliver tonality that is crisp, clear, bright and pure. The guitar delivers rich overtones and a warm low end, making the tone well-balanced and providing a full and solid sound. The versatility of this guitar is unparalleled. Whether you’re finger-picking, flat-picking or strumming, whether you’re playing folk, soft rock, hard rock or classical, whether you’re playing rhythm or filling a broad sonic space in the mix, whether you’re playing with your circle of friends or playing on stage – this guitar does it all. The guitar’s slim, fast neck gives it great playability. The strings require very little pressure, so it is great for extended playing, and barre chords are a breeze. The frets are smooth and comfortable, and the cutaway helps you reach high notes easily. Another exceptional feature on this guitar is the Expression System 2 pickup, which produces exceptionally clean amplified tone and responsiveness with few, if any, feedback problems. There is no muddiness that you may find with other systems; it gives the same natural and crisp sound as if you were playing alone in your room. Perhaps the best argument for buying this guitar is the value for price. Although the 314ce does not have all the nicer inlays and maple bindings, it sounds almost as good as the higher end models for nearly half the price of the 814ce. This jack-of-all-trades guitar may be priced at mid-level, but it plays like a pro. Given all of the accolades the Taylor 314ce earns, musicians’ love of this guitar should prove to be as sustainable as the wood used to produce it. Publisher: Anthony Chiaravallo | Editor: Gail Morrison | Disclosure: Conscious Connection received a Taylor 314ce to review for this article.